The normal tip-growing pattern exhibited by root hairs of legumes is disrupted when the hair is exposed to Nod factors generated by compatible bacteria capable of inducing nodule formation. Since microtubules (MTs) play an important role in regulating directionality and stability of apical growth in root hairs [T.N. Bibikova et al. 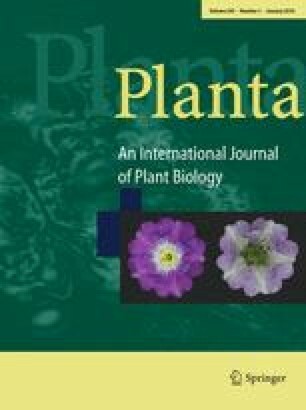 (1999) Plant J 17:657–665], we examined the possibility that Nod factors might affect the MT distribution patterns in root hairs of Medicago sativa L. We observed that Nod factor application caused rapid changes in the pattern of MTs starting as early as 3 min after perfusion. Within 3 to 10 min after Nod factor application, first endoplasmic and then cortical MTs depolymerised, initially at the proximal ends of cells. Twenty minutes after exposure to Nod factors, a transverse band of microtubules was seen behind the tip, while almost all other MTs had depolymerised. By 30 min, very few MTs remained in the root hair and yet by 1 h the MT cytoskeleton re-formed. When Nod factors were applied in the presence of 10 μM oryzalin or 5 μM taxol, the MTs appeared disintegrated while the morphological effects, such as bulging and branching, became enhanced. Compared to the treatments with oryzalin or taxol alone, the combinatory treatments exhibited higher growth rates. Since microtubule reorganization is one of the earliest measurable events following Nod factor application we conclude that microtubules have an important role in the early phases of the signalling cascade. Microtubule involvement could be direct or a consequence of Nod factor-induced changes in ion levels. Financial support was provided by the North Carolina Agricultural Research Station (NC AgResStat 407050, NS Allen) and the National Science Foundation (NSF DBI0077503, D Bird).